The Plant Boat’s Matthew Lang brings a flair for the exotic with his plant designs. GREEN THUMB: Matthew Lang’s polished and trendy plant creations take planting to a new level. “Are these fake?” Matthew Lang can’t count how many times he’s been asked that question. And no, the plants are real here at The Plant Boat. Inside Lang’s lime-green plant shop off of the Intracoastal Waterway are two rooms scattered with unique plants, such as the Asian-style Ming aralia in funky-shaped vases filled with multicolored pebbles. Leafy money trees with intricately braided trunks stand in sleek, fiberglass pots anchored with crushed aqua-blue glass. 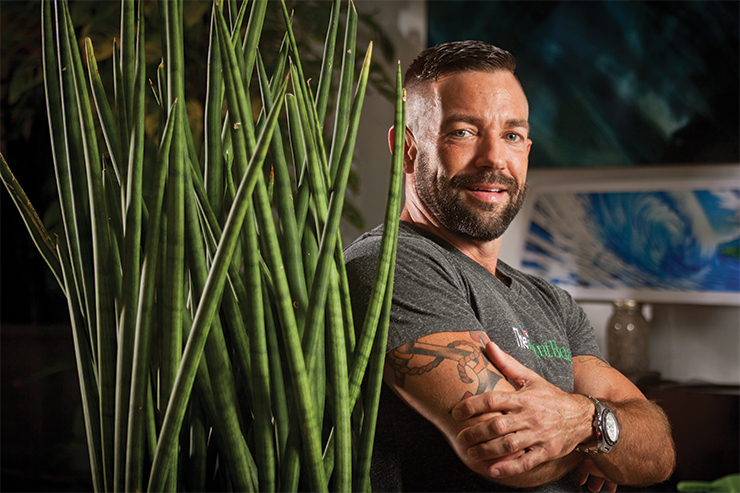 With Lang at the helm, The Plant Boat has been the go-to for contemporary plant designs, which have dotted South Florida interiors and exteriors. Lang’s passion sprouted when he was 7. As he puts it, “I was that unusual kid digging up plants and looking at its roots. I looked at how that plant was growing.” That is still the case 34 years later for this South Florida native. Lang handpicks every piece that goes into each fun creation, visiting up to 48 nurseries for the perfect plant or weekend garage sales for that perfect pot. “I’m the plant and pot guy. Period,” Lang says. Lang even has opened his showroom doors to diners at Serafina, the waterfront Italian restaurant adjacent to The Plant Boat, for an after-dinner (or even during-dinner) stroll to see Lang’s artistic plant designs, which range from $19 up to $1,000. On random late nights, customers might even catch Lang immersed in arranging a plant project. “Once I’m in it, I’m in it. And I think of nothing else besides creating. I become one with the plant,” Lang says. Then there is the spot where Lang meditates every day, an actual plant boat. The boat, a former water taxi now morphed into a floating greenhouse, is where sprouting bromeliads and anthuriums soak in the South Florida sun. Once the boat is repaired later this year, Lang plans to peddle his plants to restaurants and properties along the Intracoastal. It’s ironic how Lang, who had considered becoming a hairdresser, is now trimming orchids and ponytail palm trees. Just like his plants, business is blooming. Lang and his husband, Rodrigo, are in the works of growing their second location in Fort Lauderdale. Originally appeared in the Spring 2014 issue.